The MRSA bacteria can actually live harmlessly on your skin—until it finds an opening. The CDC says invasive HA-MRSA infections declined 54 percent between 2005 and 2011, with 30,800 fewer severe MRSA infections and 9,000 fewer deaths. MRSA, or methicillin-resistant Staphylococcus aureus, is like an out-of-control freight train. It can be stopped, but not with the methods normally used to stop a freight train, and it may do a lot of damage along the way. MRSA is a staph infection that cannot be cured with the usual antibiotics. The Centers of Disease Control and Prevention (CDC) lists MRSA as a “serious” threat in its list of antibiotic-resistant treats in the United States. MRSA (pronounced “mursa”) is most often reported in furuncles (abscessed hair follicles or boils), says the CDC, as well as carbuncles (masses of furuncles), and abscesses. 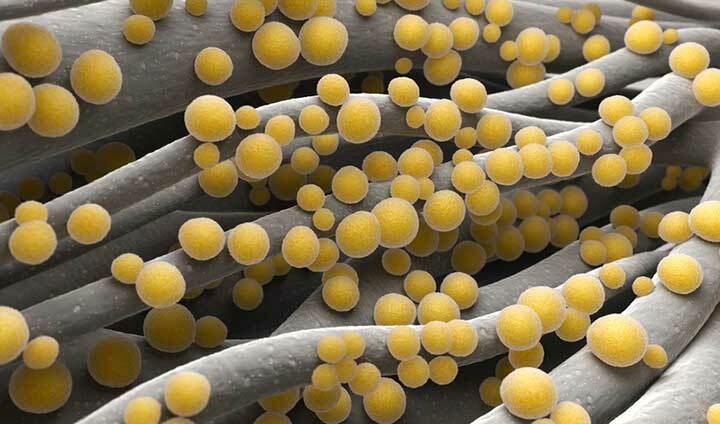 MRSA can be suspected in cellulitis and even a sty. The CDC cautions physicians to be especially suspicious of MRSA when they see pus (fluctuant or palpable fluid-filled cavity, yellow or white center, central point or “head,” draining pus). MRSA is diagnosed through visual examination and a laboratory culture of the pus associated with the wound. The CDC advises physicians to be suspicious of any alleged “spider bite,” because MRSA typically appears as a raised lump that is swollen and painful, with a red rash or pimply other bumps near it. The MRSA infection can also “burrow” into the skin and invade other organs, which can become serious. If the infection spreads to the blood (bacteremia), the patient may experience fever and chills, and may invade other body organs. According to Medical News Today, approximately 94,360 invasive MRSA infections are diagnosed annually in the United States with 18,650 associated deaths (around 20 percent). About 86 percent of all MRSA infections are healthcare-associated (HA). But there is good news: The CDC says invasive HA-MRSA infections declined 54 percent between 2005 and 2011, with 30,800 fewer severe MRSA infections and 9,000 fewer deaths. You can contract MRSA in one of three ways: If you touch the skin of a person with MRSA, if you touch an object contaminated by MRSA bacteria, or if your skin is home to colonies of MRSA. As with staph infections, the MRSA bacteria can live harmlessly on your skin, until it has an opening to invade a wound. A 2000 study published in the Journal of Clinical Microbiology, looked at the survival rate of Staphylcocci on typical hospital materials, like fabrics and plastics. They found its viability was longest on polyester (one to 56 days) and on polyethylene plastic (22 to more than 90 days). As with any staph infection, MRSA is contagious. There are two types of MRSA: HA-MRSA (healthcare-associated MRSA) and CA-MRSA (community-associated MRSA). HA-MRSA occurs in health-care facilities, and CA-MRSA occurs in society where people have skin-to-skin contact, such as athletics. While approximately 30 percent of people have staph-infection bacteria on their skin, 2 percent of people have MRSA. “In a healthcare setting, such as a hospital or nursing home, MRSA can cause severe problems, such as bloodstream infections, pneumonia, and surgical site infections. If not treated quickly, MRSA infections can cause sepsis and death,” says the CDC. It’s usually spread by direct contact with an infected wound or contaminated hands (the FDA says that the MRSA bacteria cannot be killed by “hand sanitizers”). The CDC says CA-MRSA in athletics is most common in sports with a lot of physical contact, like wrestling, football, and rugby, although it’s also been reported in soccer, basketball, field hockey, volleyball, rowing, martial arts, fencing, and baseball. MRSA is believed to spread before after the sporting event, such as in the locker room. It’s important for athletes to be aware of the symptoms of MRSA and report any infections immediately. Medicinenet.com says that most physicians treat MRSA with incision and drainage of boils and abscesses, which helps them heal. If the infection is mild, that may be enough. If an antibiotic is needed, physicians commonly choose among vancomycin (Vancocin), ceftaroline (Teflaro), linezolid (Zyvox), daptomycin (Cubicin), dalbavancin (Dalvance), and telavancin (Vibativ). Moderate and severe infections, need IV antibiotics. Less-severe infections may be treated with trimethoprim-sulfamethoxazole (Bactrim), doxycycline (Vibramycin), and clindamycin (Cleocin). Antibiotic combinations are often used. The choice depends upon the results of the laboratory culture. Researchers at Johns Hopkins and the University of California-Davis have discovered how the immune system might protect a person from recurrent bacterial skin infections caused by Staphylococcus aureus. The findings, published in The Journal of Clinical Investigation, open new doors to someday developing vaccines to prevent staph skin infections. Using mice with defective immune systems, the researchers found that after an initial exposure of the skin to staph, they were surprisingly protected against a second skin exposure with the same bacteria. After testing for antibodies and other “usual suspects” of the immune system against this infection, it wasn’t clear what immune response was protecting the mice. The researchers then tested a drug FDA-approved for treatment of multiple sclerosis, which acts by preventing certain immune cells from leaving lymph nodes for sites of inflammation. “We couldn’t have figured out what was happening without the expertise of our collaborators at U.C. Davis, who determined the genetic sequence of every single cell marker on the cells in the lymph nodes,” says Lloyd Miller, M.D., Ph.D., associate professor of dermatology at the Johns Hopkins University School of Medicine. That genetic sequencing data revealed that specific cells substantially multiplied after the initial infection, then moved to the infection site and provided protection against the second infection. These so-called gamma delta T cells account for less than 1 percent of all the cells in the lymph node prior to infection. After infection, they accounted for more than 20 percent. Since this work was performed in mice, the team wanted to see if its findings were applicable to people. Working with collaborators from the National Institute of Allergy and Infectious Diseases at the National Institutes of Health, the researchers tested blood from healthy individuals and people with a rare immune disorder that makes them highly susceptible to staph skin infections. In blood samples from these patients, the researchers found an increase in the percentage of gamma delta T cells, similar to what they observed in mice, which remained stable over years. The hope is that these new findings, and especially gamma delta T cells, may be targeted for developing new therapies or even a vaccine against staph skin infections. allergy, antibiotics, bacteria, health, immune system, infection, inflammation, medical news, mrsa, multiple sclerosis, Nursing home, pneumonia, report, skin, staph infection. I was diagnosed with multiple sclerosis 1 month after I turned 50. My Grand-mum was 96 and had it since she was in her 20s. I was on Copaxone, the first year was daily and later I was on 40 mg, 3 times a week. It made a tremendous difference for me. Although the fatigue was what really gets to me. When I do too much, I do start to feel weak.There has been little if any progress in finding a cure or reliable treatment. My multiple sclerosis got significantly worse and unbearable because of my cognitive thinking.. Last year, i started on a natural multiple sclerosis Herbal therapy from Green House Herbal Clinic, i read a lot of positive reviews from patients who used the treatment and i immediately started on it. I had great relief with this herbal treatment. I am doing very much better now, no case of Cognitive thinking or memory Loss,, my multiple sclerosis condition is totally reversed. Visit Green House Herbal Clinic website I am thankful to nature, the medics failed. Share with friends!! I saw an infectious diseases doctor and he said I had to be on doxycycline for the rest of my life. I went today and my wbc was 11 something. I’m wondering if I should be worried. I just have a primary care dr as of now. Both hips have been replaced.